If you’re a fan of raw food, Prague is definitely the place to be. There are approximately nine trillion raw vegan restaurants here. Personally, I’m not a raw enthusiast: I find it expensive, sometimes not as good as the cooked version (things like crackers, bread and falafel, all of which I’ve tried raw), and unsuited to the freezing winters of the Czech Republic. Raw cake, however, is a whole different story. Sweet Secret of Raw is a pretty little cafe in Prague 2 (not too far from the city centre) with an extremely tempting display of cakes. 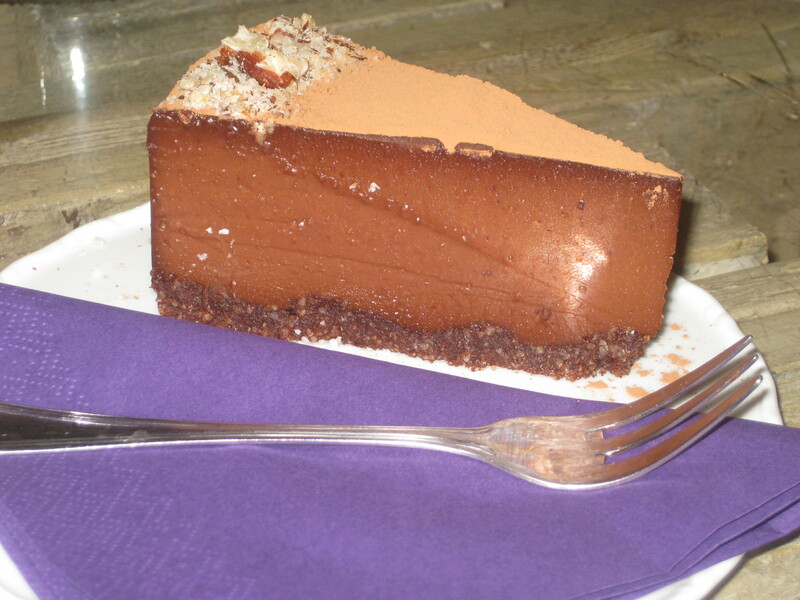 The chocolate cheesecake is so rich, I actually struggled to finish it – and that’s saying something for me! In fact, all of the cakes are fairly substantial. When you leave this cafe, you certainly know you’ve eaten well! 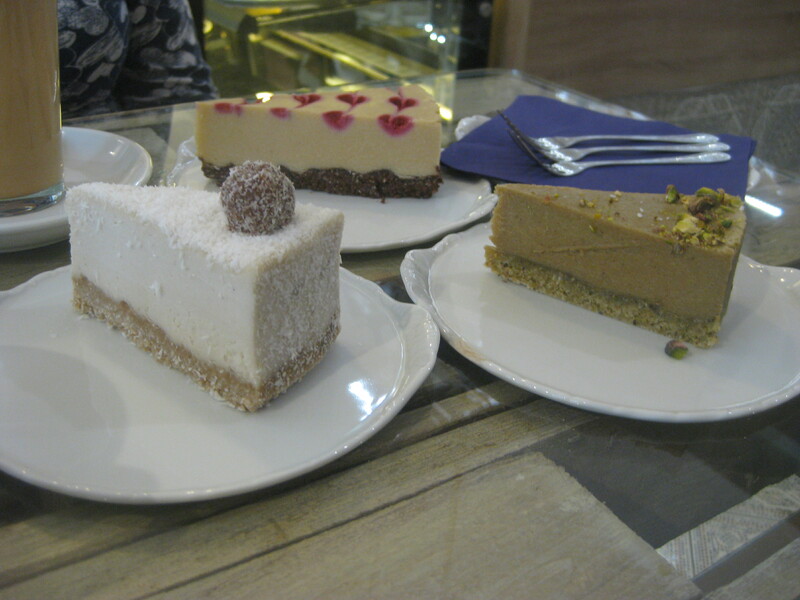 The Raffaelo cake at the front here was especially delicious. There are always 5-10 cakes on offer, along with the tasting menu where you can have slivers of them all. Dr HH is keen to try this, but I just don’t think I could handle that much cake! The cakes are all labelled only in Czech, but the staff usually speak a little English, or you can just gamble on the most delicious-looking concoction. They do have an English breakfast menu though. Breakfast is served 8am-12pm, and it’s pretty exciting fare. 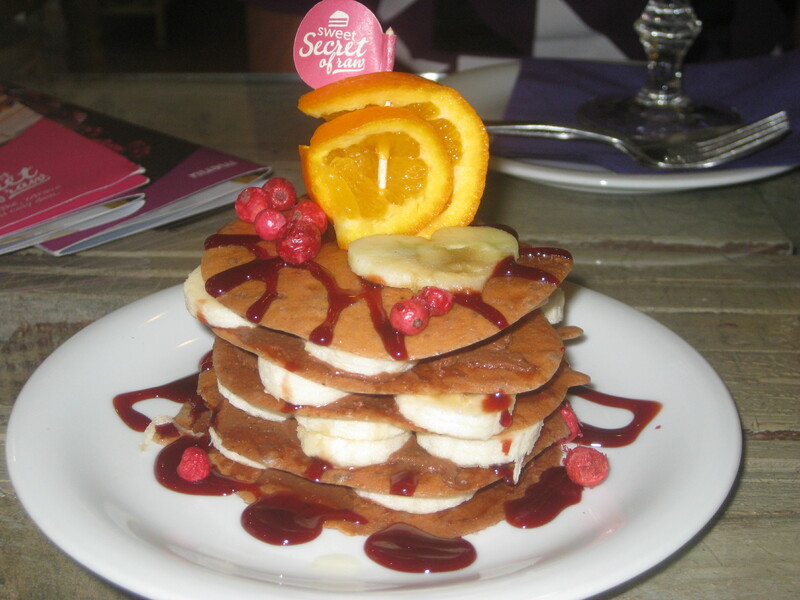 Alongside a few porridge varieties, there are these pancakes with chocolate cream and banana slices. It’s quite hard to cut through the pancakes themselves, but it’s a really delicious meal. I was worried it wouldn’t be filling enough, but I was absolutely stuffed! Dr HH ordered a dish called ‘caramel squares’, so we were quite surprised when this glass appeared. 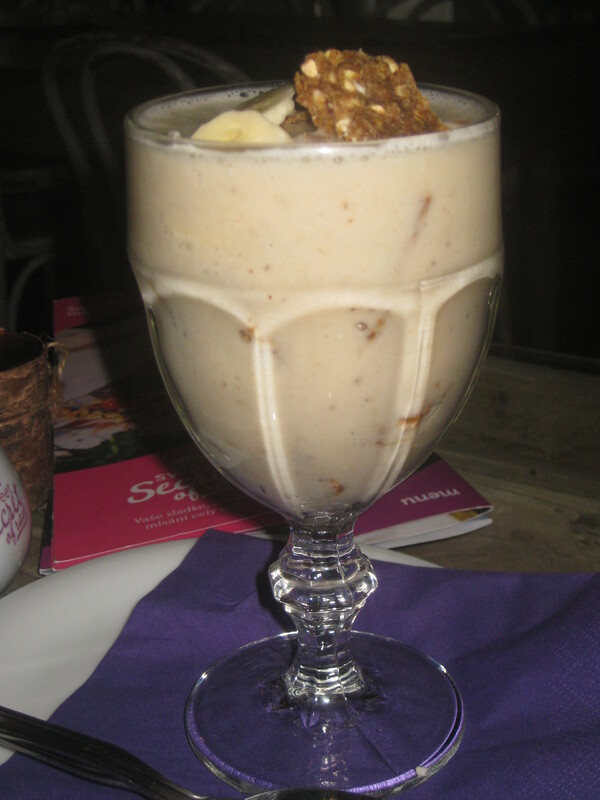 But it’s not merely a smoothie: the glass is full of date, peanut butter and sprouted buckwheat squares (kind of like a Nakd bar), smothered in a banana milkshake. He really enjoyed it, and was also too full to contemplate a cake afterwards. If you’re ordering one of these breakfasts, you probably don’t need to have a hot chocolate too. I mean, this is insanely good, but it’s also thick and rich and might push you over the edge if you’re having a huge breakfast too. 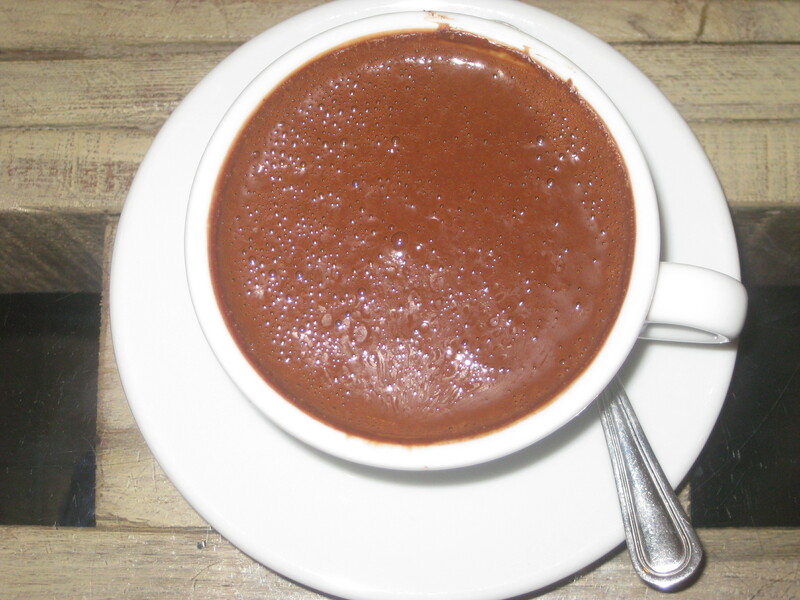 The drink has a beautiful ginger flavour running through it, and it’s one of the best hot chocolates I’ve had here – and Prague is a pretty amazing city for vegan hot chocolate! Do try to squeeze in a trip to Sweet Secret of Raw if you’re in Prague. They don’t do savoury food, as the name suggests – making it the perfect indulgence when you’re treating yourself on holiday! 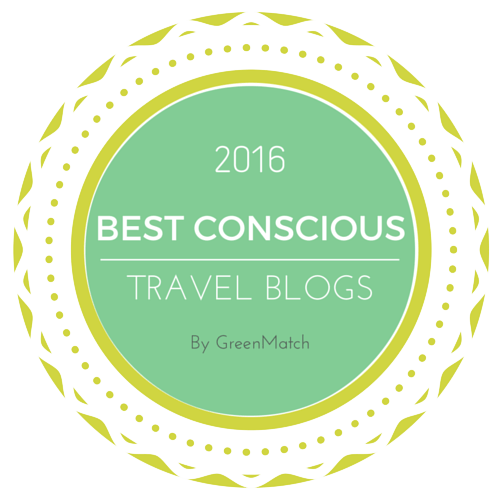 This entry was posted in Travel and tagged Sweet Secret of Raw Prague, vegan breakfast Prague, vegan cake Prague, vegan Prague, vegan travel. Bookmark the permalink. So would like to go back one day. It’s been nearly 20 yrs, there were hardly any vegetarian options back then, let alone vegan! I’ve heard that before and can never believe it – clearly the vegan scene has exploded since then! I can think of a few vegan restaurants that have opened up just this year!